As I searched back in my “trea­sure of artists” (a very large part of my “morgue” or “scrap file” kept as a commer­cial artist), I real­ized that just in this SF Bay Area there were events and places and creative people — all coming together for this brief telling of those times. Born in 1911 in Oakland, Cali­fornia, Dong Moy Shu trav­eled at the age of five years with his parents to Hong Kong. He was taught tradi­tional Chinese arts. As a very talented young painter, he was given the name of “King‐man” (this was Cantonese for ”scenery compo­si­tion”). Dong married Janice Wong and when he became eigh­teen years of age he returned to Oakland with his new bride. In 1933, Dong moved his family to San Fran­cisco and in1936, he had his first large showing of 20 paint­ings, gaining him high crit­ical acclaim. For income during the diffi­cult Depres­sion of 1939, Dong Kingman worked for the WPA‐the Works Progress Admin­is­tra­tion. Quoting Dong Kingman: “An angel descended on me…for the first time in my life I had a studio of my own…my studio was right behind a café called The Black Cat, which was where all the char­ac­ters hang out”. There is a lot to be found on the web about “The Monkey Block”, “The Black Cat Café” and neigh­boring build­ings where artists had studios and housing on upper Mont­gomery Street in San Fran­cisco. FDR’s New Deal offered a lot of work under govern­ment spon­sor­ship. Paul Cary was there at the Mont­gomery Block. He has described figure drawing sessions and as an artist, earning $75 dollars a month! Built by 1853, demol­ished in 1959 and replaced with the Transamerica Pyramid starting in 1969 and completed in 1972. During WWll, Dong Kingman served as a cartog­ra­pher in the Office of Strategic Services. Following the war, he taught at many collages and univer­si­ties including the Famous Artists Schools of West­port, Connecticut (in 1953) and the Academy of Art College in San Fran­cisco, serving on its board and receiving its honorary doctorate. I can’t find the year of his time at the Academy of Art, but it would have been when its founder Richard S.“Pappy” Stephens (also from Oakland) taught there. Richard and Clara Stephens founded the Academy of Adver­tising Art in 1929. At that time, Pappy spent half of his time as creative director for Sunset Maga­zine. Again, the US govern­ment helped artists and schools. After the Korean War, the GI Bill helped the Bay Area’s artis­ti­cally talented to school at the Academy. Of the new enlarged enroll­ment of 54 students, 50 got placed in jobs. The San Fran­cisco area, with its natural cool climate, was a major printing loca­tion before air condi­tioners reached hotter climes. So artists, art schools, adver­tising agen­cies, and printing houses flour­ished. I was lucky to have even one class with ”Pappy” Stephens when I won a summer schol­ar­ship in 1962. Pappy would take his sketch class to Tele­graph Hill and have coffee with the students at a Fisherman’s Wharf coffee shop at water’s edge that later became “Scoma’s” restau­rant. In 1951, from Time maga­zine, “At age 40, Kingman is one of the world’s best water­col­orists.” Dong Kingman is known for his fine art paint­ings, but the general public was able to know of his talent through the price of a maga­zine or a box of Christmas cards. 2. The two ads, February and March 1963, were for the Hong Kong Tourist Asso­ci­a­tion. Sunset Maga­zine, Lane Publishing. 3.“San Fran­cisco, with vari­a­tions” was the first of a series of Dong Kingman’s paint­ings of America’s great cities for the “Amer­ican Weekly”, (a Sunday news­paper supple­ment) December 3, 1961, ©Hearst Publishing Co., Inc.
4. 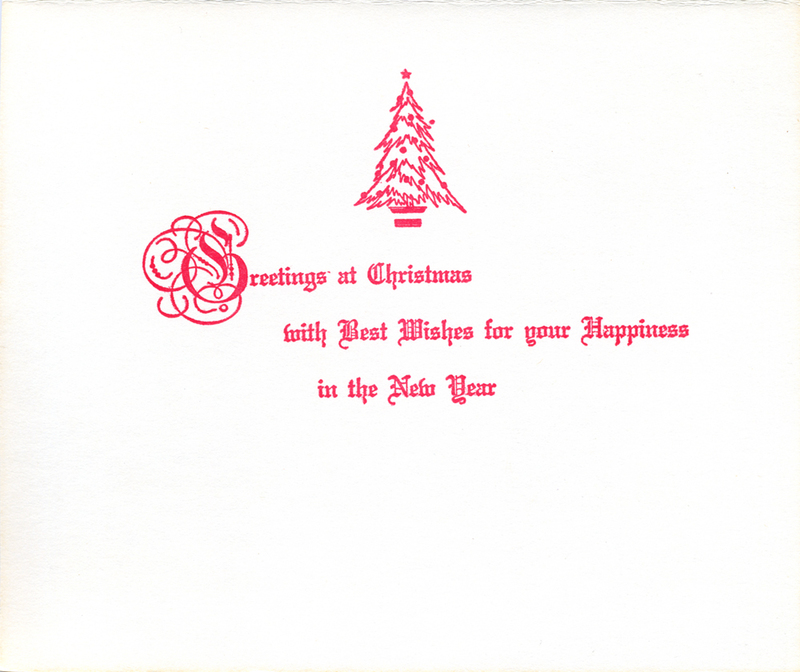 Also, I include the Christmas cards that I have also saved, lo all these many years, not sending them in order to keep them in my collec­tion. There is a “union bug”, but no date. Printed by Cathay Arts S.F. Cal. Litho in U.S. A.